This menacing Grim Reaper with Lighted Lantern will scare the living daylights out of guests and passers-by! His bony fingers hold a chain with a lantern that lights up, and his gauzy cloak floats in the breeze, giving him an increased supernatural appearance. 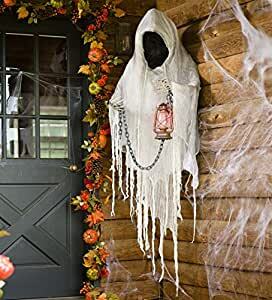 Hang this life-sized, battery-operated specter of doom in a tree or by your door for a truly creepy Halloween display. Polyester, plastic and foam construction. Takes 2 AA batteries, not included. Imported. Size: 60″L x 12″D x 60″H.